HDPE DR11 plugged mortar tube. This is the most common tube we sell as it's the most universal fit for consumer shells. 12" long. 1.91" ID (inner diameter). 2.4" outside diameter. Secured with 4 staples. Can be used for all consumer canister, ball and mine shells. Also can be used for 1.75" salutes. Minimum order quantity: 6 Please note that some of tubes may be slightly out-of-round. This is unlikely. It won't cause any issues whatsoever in the effect or lift of the shell. HDPE DR11 plugged mortar tube. 15" long. 1.91" ID (inner diameter). 2.4" outside diameter. Secured with 4 staples. These are generally used with shells with a longer leader fuse and it's generally accepted that gives you a higher lift, although it's never been proven. Back order delay: Please allow 5 to 7 business days before these ship out. Plugged HDPE DR17 Display mortar tube. 18" long, 3.03 Inner Diameter. 3.5" Outside Diameter. Stapled 5 times with 16 guage galvanized staples. Solid wood plug. Please allow an extra 5 business day before it ships. HDPE 4" DR21 display mortar tube. It has a 4.0" inner diameter (ID). The plug is 3" tall and has 8 exterior grade screws to hold the plug in place. Length is just shy of 24 inches. BLUE HDPE DR9 plugged mortar tube. 12" long. 1.81" ID (inner diameter). These tubes will be arriving the first week of June (2018) and will be blue. 2.4" outside diameter (same as DR11). Secured with 4 staples. The ID is 1/10" smaller than the standard DR11 mortar. Please allow 3 to 5 days before it ships out. A 20-page booklet about basic consumer rack design. 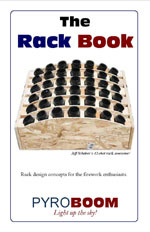 If you are new to rack building then this book is for you. Covers safety and the recommended style to build consumer racks. Also included are several pictures of rack builds from across the country. A great add-on item. Irregular HDPE DR11 mortar. They might be plugged, but it's highly unlikely. These are extra mortars we have laying around, but are not good enough to sell as 12" DR11. They might be dirty and some of them have been sitting outside. They also may have staples that are not fully inserted. The length will vary from 7" to 12". Some of them might egg shaped and/or out of round. Please understand what you are buying (in a sense it's a grab bag). No returns accepted. It's highly recommended that you buy mortar plugs to go along with the tubes. 1.91" ID and 2.4" OD. HDPE Plugged 1.25" ID (inner diameter) DR9 mortar tube. This is a smaller sized tube for use with 1" or 1 1/4" shells consumer shells. 9" long. The OD is 1.65"
5" HDPE display mortar tube. HDPE DR21 5.0" ID and 28" long. The tube is plugged with a 3" thick wooden plug. Secured with 4 galvanized screws and washers. For use with 5" firework display shells. HDPE 2.5" ID DR17 display mortar tube. Solid wood plug and stapled 4 times. 18" long. For use with 2.5" display shells. Please allow 3 TO 4 weeks before delivery. 6" display mortar tube. HDPE DR21 6.0" ID and 33" long. The tube is plugged with a 4" thick wooden plug and with galvanized screws and washers. Please allow 2 to 3 extra business days for processing. HDPE Unplugged 1.81" Inner Diameter DR9 mortar tube 12" long. Please note these are not plugged. You will need to purchase a mortar plug (we currently don't sell these). The OD is 2.4"
12" Mortar (no plug) tube. HDPE DR11 tube. 1.91" ID and 2.4" OD. These tubes will not contain a wooden plug. Our firework consumer mortars are made out of the industry standard high-density polyethylene (HDPE) DR11 & DR9 pipe. The 12" DR11 is the most common mortar for consumer fireworks. Some like the DR9 for use with slightly smaller shells. Each mortar is plugged with a 1.5" thick solid wood plug stapled in 3 to 4 times. We take a great amount of time in our craftmanship of these tubes. We quality inspect each tube to make certain you will be pleased with our product. Click on view larger image for more size details about our mortars.